Less than a week to go until polling day now and my election buzz still is starting to kick in. I can only speculate on why it took so long, that it might be things like age (I’m now a family man and supposedly more mature) or that we’ve just been campaigning constantly for so long that it wasn’t really that different when the election was formally announced. But it also occurred to me today I’ve just not seen any opposition activity. Perhaps I’m not looking hard enough, but having been on the streets day in and day out for the past few weeks I rather expected I would have seen more. 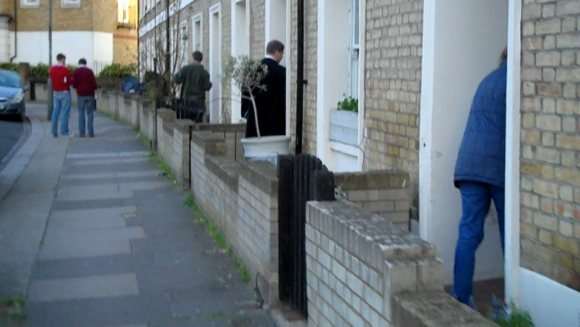 If they are out campaigning they are either doing it elsewhere, or in a very low key way – I’ve not had any leaflets from any other party and have only seen a couple of Labour activists in the ward, one delivering and one who was lost on Lavender Hill. This is totally different to years gone by. While I don’t think I’ve ever seen the Liberal Democrats campaign in Battersea, the Labour and Conservative Parties had some real battles. In 2005 there was a regular competition to see which of us could muster the most people at Clapham Junction each Saturday. Dozens from either side would run street stalls and, I would imagine, depress trade for the local businesses as people avoided us. Going further back to 1998 when I was first a council candidate we would regularly cross paths with the Labour candidates on the streets. And just as regularly have a drink with them in The Lavender at the end of the evening. Indeed, we would often all end up in Andersen’s (then the area’s only late night bar, which celebrated its monopoly by selling watery lager and never, ever, cleaning). It was a battle, but it was fun and the rivalry was friendly. Above all, it was personal, we knew each other because we were doing the same thing and got on together because of it – we disagreed about policy, but our motives were the same. Maybe this time the other parties are campaigning differently, perhaps concentrating on the phones or targeting heavily, so we don’t see them. But I can’t help but feel that we’re losing something when campaigns become so impersonal we don’t even see our opponents. Instead, I have to console myself with seeing the occasional tweet or dipping into blogs run by opposition activists and candidates. Although these invariably pretend everyone is supporting them (and become so banal and partisan as to be pointless) you can sometimes read between the lines: for example, Stuart King’s blog seems to spend an inordinate amount of time having a go at the Lib Dems, which leaves me wondering if Labour are worried about losing second place there. But generally, it seems we are campaigning in a vacuum here. That’s not to say I’ve not enjoyed it. It has, so far, been a fun campaign. We’ve set a great pace and covered the ground. Then covered it again. And again. And, in some places, again. If we’ve not managed to see you over the past four weeks (or four years) it’s not because we’ve not tried – it’s because you have a great social life and you’re never in. And as well as covering the ground, the response has been the friendliest I have ever known, though admittedly I’m using 1997 as my benchmark, and it’s hard to imagine a less friendly time than that to be a Conservative activist! Now we are entering the final phase, with several days frenetic activity building up to election day next Thursday. Hopefully we’ll make all the hard work – and the friendly response – pay off. Loads of Conservative pamphlets have been trickling into my mailbox (I live next to Battersea Park), and nothing from the other parties. But surely it’s more about the manifesto of each party compared to who puts effort into spamming people? Can some people really be swayed to vote a certain way, because distributing pamphlets in a borough somehow represents how much effort the party will put in once they get into power? A small proportion of people do vote on the basis of who they think has been hardest working. And there are a significant proportion who complain that we “only ever come during elections” (which is not true). However, keeping in touch with the electorate is a key part of being a councillor (or any elected representative) and doing that through a political party a way of doing that. The leaflets reflect, to a degree, the manifestos of the parties and give an indication of the work that the candidates have been doing. They are not spam. Whilst leaflets are a good way to get policy across, we’ve had about 7 from the Conservatives, which just seems like a waste of money and trees. I’d say there’s a fair fight locally but with a variety of approaches. The Lib Dem candidate has put a lot of personal effort into online campaigning, which seems like the most cost-effective way to reach the maximum number of voters. Martin Linton has also ramped up his blogging and twittering, and Twitter is the only reason I’ve know anything about where campaigners will be and how to hear them speak. If leaflets also mentioned upcoming campaign events, especially Hustings, then they’d be more justified. The best of my Conservative leaflets listed the local councillors, which is where the real battle-less election is – there’s almost no info on these, and I’m concerned that most people (excluding those who read this blog!) don’t know what they are, how they vote, or what they’re voting for. Or maybe the other parties do think it’s a waste of money in Shaftesbury to campaign, but that seems like a shame.